The Hooper Hooner is the brain child of the Tidworth Freeride Crew, taking its name from Hooper’s Struve the track that’s used for racing. 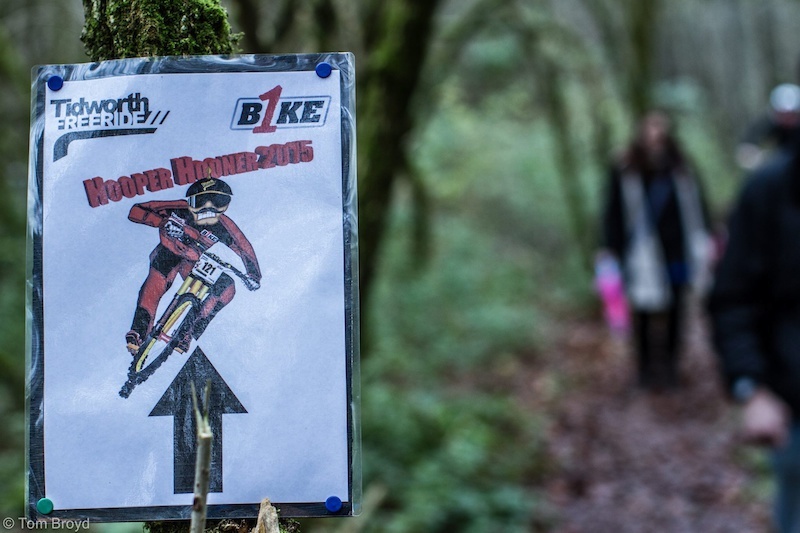 2015 is the third year that the Hooner has rounded out the season for Tidworth Freeride and it went down as a classic. Everyone had an eye on the weather in the week running up to the race and their fingers crossed that what looked like a break in the weather would open up on Sunday. For those that were on track Saturday after heavy overnight rain, it was a rather challenging Hoopers Struve that greeted them. As the rain stopped and the track dried riders were reporting that their bikes were almost doubling in weight in one run, not a particularly good sign for the following day's racing. Overnight the wind picked up and as dawn broke on race day it was looking like the riders’ prayers were going to be answered and the unthinkable was about to happen, the trail was going to dry out for the race runs! Practice was still a bit sketchy in places especially for those keen enough to be on track early. For those starting practice later there were signs of a dry line forming although the pedal through to the finish was still a bit of a ‘lung burner’. The racing kicked off with the Juvenille Men (12-14yrs) with a few of the B1KE Junior Development Programme (DeVo) Rippers thrown in for good measure. 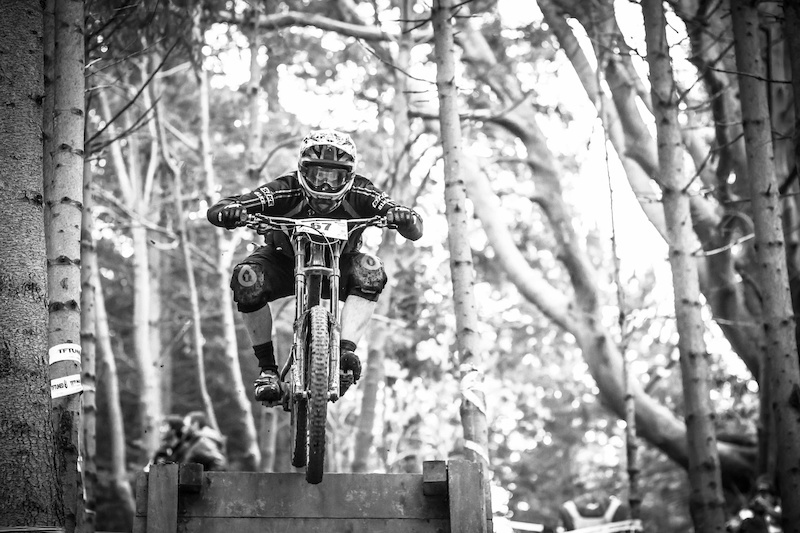 Jeremy Coe (B1KE DeVo) set the pace on his first run with a time of 1.08.90 and then did enough on his second run to edge Tidworth Freeride local James Ryan into second place by 0.10 of a second. Jonathan Heasman (Whisper Bikes Dev. Team) rounded out the top three placings with a time of 1.09.48 showing great consistency on both runs. Eleven year old Tom Shakespeare took the win in the B1KE DeVo Rippers with a time of 1.23.64 he was closely followed home by 9yr old Kenzie Nevard (Kona) and 11yr old Lewis Hallwood rounded out the top 3 with a time of 1.32.75 despite crashing on both runs. Look out for a Ripper’s category at next years events. Josh Mead (Team Aston Hill) made his first outing for his new team one to remember. Taking the win with a time of 0.59.78 which, was good enough for 12th place overall on the day and would have given him the win in the Junior Men’s. Josh nearly didn’t have things all his own way though with Will Easey (Superfreak Racing) just 0.63 seconds behind in second with a time of 1.00.41. Jack Miller (Blue Chip/Shiner Bikes) just edged out Will Turnball (Superfeak Racing) to take 3rd place with a time of 1.04.35. Whilst it was great to see the strength in depth of the Juvenille and Youth Categories the Junior Men’s race only saw five riders going for the honours. It was Mattie Coate that came out on top with a time of 1.02.53 with another tiny winning margin of just 0.86 over Seb Mansfield with Thomas Mills rounding out the top three placings with a time of 1.10.15. One category that continues to grow year on year is the Women’s and it was great to see 8 women sign-on for the Hooner. It was Aston Tutt who set the pace with a time of 1.09.93. With birthday girl Rachael Gurney rounding out the top three with a time of 1.17.59. Thanks to Rachel and Mountain Biking UK for all their support and the promotion they’ve given to Tidworth Freeride and the Hooper Hooner in 2015. We’ll be working hard to get even more women racing in 2016. Putting the youngsters to shame there were as many Grand Vets as there were juniors racing. To be a Grand Veteran you have to be over 50 and it was great to be able to run their own category. Paul Jacobs just edged out Richard Abbott from category sponsors Ridgeline. Paul stopped the clock on 1.02.13 and Richard clocked a 1.04.10. Karl Woodman who kept everyone one amused all day racing dressed as a Gnome proved that aerodynamics mean nothing if your racing in fancy dress clocking a time of 1.02.55. Giles Austing (Mulebar) category winning time was quick enough for 3rd place overall on the day so it was down to the rest of the Vets to fight it out. Mountain Bike legend Steve Geall lead the charge with a time of 0.59.65 and Shane Maciak (Woodsman) rounded out the top three with a run time of 1.02.85. 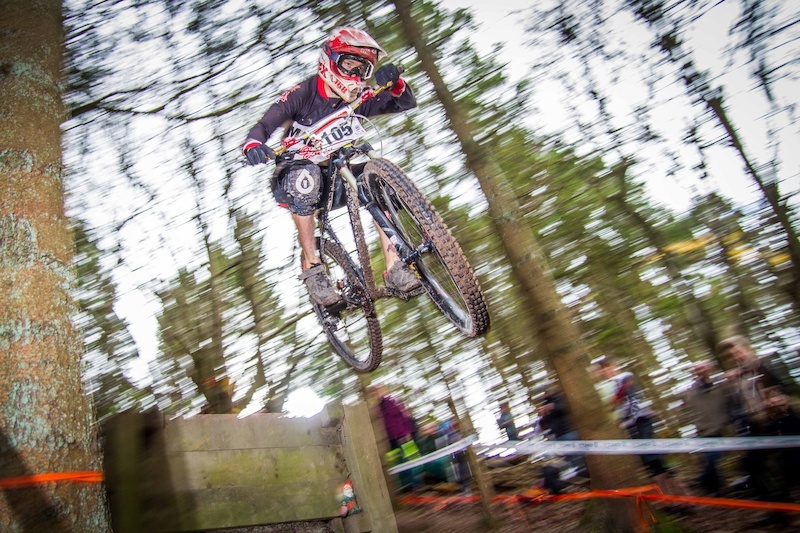 After a less than stellar first run Tidworth local Aaron Budden put together a second run that saw him just sneak the top step by just 0.10 of a second from Guy Chandler. Guy was pushed all the way too by Andrew Gardiner (Gravity Project) who rounded out the top three with a time of 1.01.40 just 0.23 of a second behind separating the top three riders by just 0.33 of a second. The shorter course and the fast sprint at the bottom of the track probably suited the Hardtail riders but the steep middle section was enough of a challenge on a Hardtail. It was Stephen Jones (Malvern Cycle Sport) who set the pace with a run time of 0.57.43 fast enough for 5th place overall. Zak Hurrell (Mudhugger/Ducksmart) took second just 0.77 off Stephen’s time and Matt Colins (Team Mitchells Cycles) took 3rd place on 0.58.65 just 0.21 of a second behind Matt continuing the trend for tight times at the top of the time sheets. It’s been a strange old season for Ben ‘the Deakinator’ Deakin (Santa Cruz/Muc-Off). An injury at the start of the season meant he was sidelined for most of it. So it was great to see Ben back on form and flying down the track. He stopped the clock on 0.55.25 on his first run to set the fastest time of the day and then showed his consistency with two near identical times. Darren Evans (B1KE) wasn’t far off Ben’s time though with a time of 0.56.53 and Sam Marzetti rounded out the category just 1.54 seconds behind Ben with a run time of 0.56.79. Having rapped up the win in the Expert Men’s category Ben Deakin (Santa Cruz/Muc Off) was elated to retain his Hooper Hooner Championship Title for a 2nd year. Darren Evans was just 1.28 seconds behind Ben and Veteran racer Giles Austing rounded out the top three with the fastest riders on the day separated by just 1.31 of a second showing how close times had been on the short but feature packed trail. 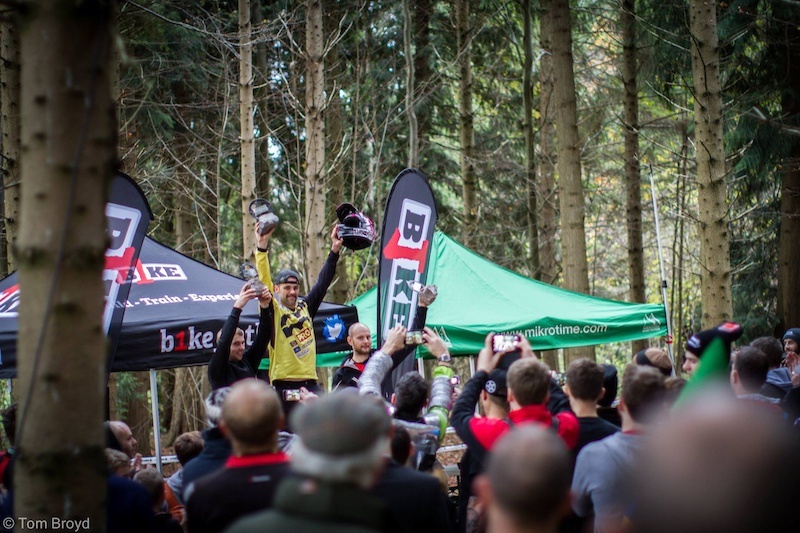 Thanks to everyone that came and raced, the supporters who made the atmosphere in the woods more like a World Cup than a local race, all the Marshals, First Aid, and Mikrotime on timing duties. Pothead and Panface for keeping everyone fed and watered and of course our sponsors. TF Tuned, Raw Sports, Clive Mitchel Cycles/TCM, Kona, Stonehenge Cycles and Ridgeline. 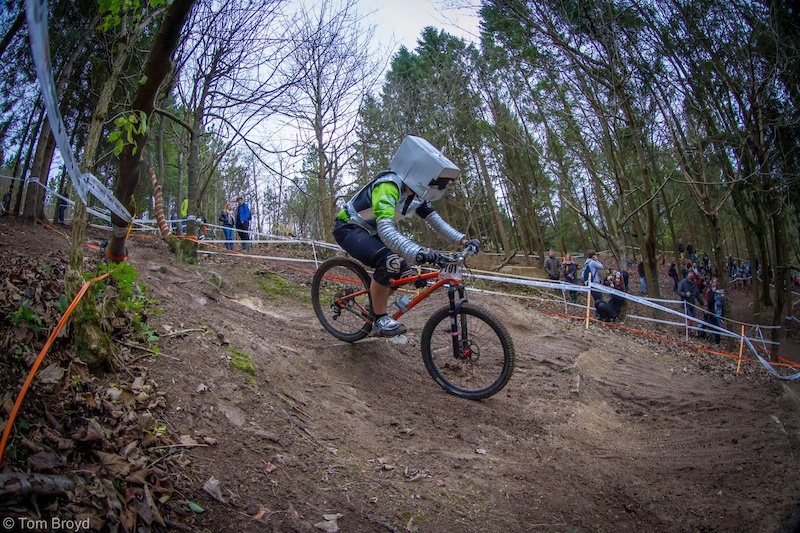 Look out for more races and events coming to you from Tidworth Freeride in 2016. Check out all the results on Mikrotime. Damn that's close for the hardtail catagory... what were most riders getting? Not gonna lie, the hardtails smashed it down, respect to them. I could have my name in an article front page on Pinkbike and it gets messed up. Just the hardtail category, weep weep. I came 3rd with 1.04.55. Stephen Jones did bloody smash it ! The hardtail cat is all completely off except the astonishing ride by steve.